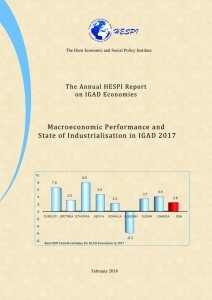 HESPI’s 2017 flagship annual report constitutes two parts. The first part is an overview of the macroeconomic environment in the Inter-Governmental Authority on Development (IGAD) region and the second part presents the status of industrialization in the region. Overview of the macroeconomic environment shows that most countries have registered moderate or high economic growth, except South Sudan, whose Gross Domestic Product (GDP) contracted due to the ongoing civil war in the country. Except in the Sudan and South Sudan, Consumer Price Index (CPI) has been in single digits in 2016 owing to tight monetary policy. Looking at the fiscal balance, Ethiopia and Sudan had a fiscal deficit less than the Sub-Saharan Africa (SSA) average in 2016, while Eritrea, Kenya, South Sudan and Uganda exceed the SSA average and Djibouti registered a fiscal surplus. All countries, except Uganda have seen a significant decline in their export earnings in 2016. With an increasing imports bill, the declining export earning has exacerbated the current account deficit in most IGAD member countries. Investment as a share of GDP remained low by SSA standards, although growing in recent years. Foreign Direct Investment (FDI) inflows have been consistently increasing in Ethiopia, although declining in Kenya, Sudan and Uganda in the last couple of years. Remittances inflow have been large in absolute terms to the region; with Kenya ($1,727 mn), Somalia ($1,489 mn), and Uganda ($1,078 mn) receiving in 2016 the largest amounts from their diasporas. 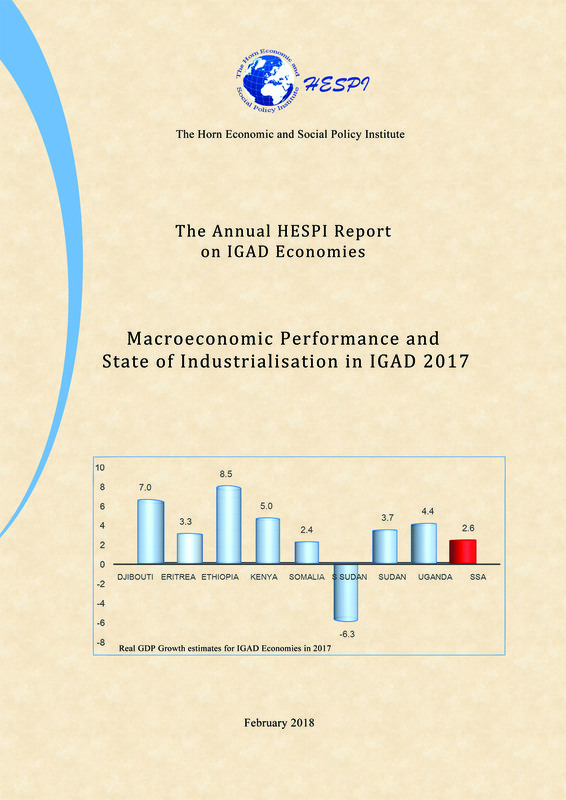 Assessment of the status of industrialization (manufacturing sector performance) in the region shows that the share of industry in GDP has been either stagnant or declining 2-3 decades after 1981, except in Ethiopia and Uganda. Likewise, manufacturing value added as a share of GDP has been stagnant or declining for all countries over the last 2-3 decades, except in Uganda. Moreover, manufacturing exports as a share of merchandize exports has been stagnant over the last decade in all countries. Among the major reasons for weak manufacturing sector in the region are little exports participation, weak organizational capacity, and weak supply chain linkages between high productive medium/large enterprises and low productive small enterprises. Other key factors have been passive government support limited to improving the investment climate, as well as failure of the Special Economic Zones (SEZs) in attracting FDI, job creation, export and productivity spillover. Despite the challenges, there are prospects for the manufacturing sector in the region. First, various flagship infrastructure projects are taking place, which are hoped to enhance the competitiveness of the manufacturing sector. Second, shrinking surplus labor and rising wage in Asia, particularly in China creates huge vacuum in labor intensive industries, which IGAD countries can fill, with right industrial policies. This has enormous potential for job creation and manufacturing export. Third, there is growing international support for industrialization in developing countries including IGAD. The report emphasizes that investment climate reforms are necessary but not sufficient condition. Hence, governments should make direct support in capacity building, finance and marketing to enhance competitiveness of the manufacturing sector in their respective countries. They need to push for export to develop firm capability; strengthen value chain relations between firms in SEZs and those outside the zones; and improve on trade logistics.